"What is it", "No I've never heard of it", "What is it"? JUST WHAT IS THE UNION OF CATHOLIC MOTHERS? Our public service officer monitors bills going through both Houses of Parliament. 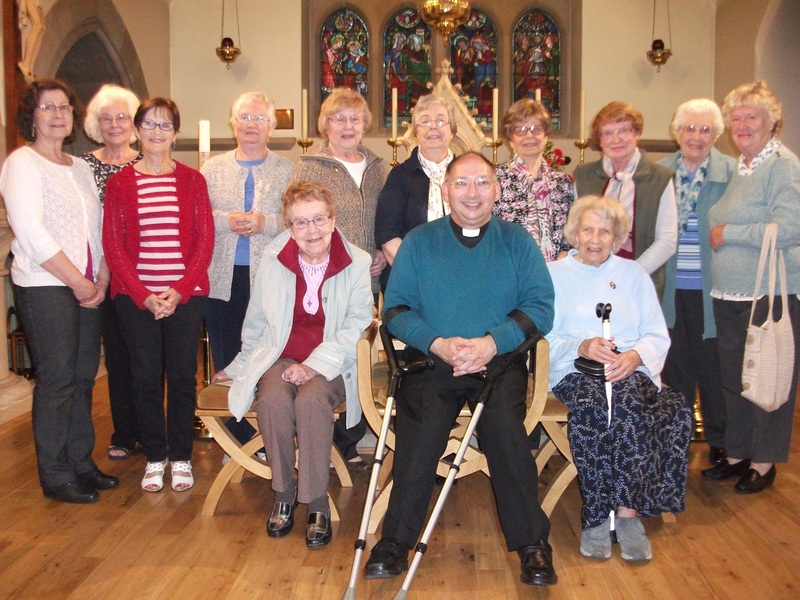 Our welfare officer with her diocesan and parish welfare officers looks to the needs of the disabled, elderly and those who are ill. She works with the National Holiday and Rest Homes Service to provide holidays and rest care where necessary. There are other officers who keep an eye on the media, organise the annual pilgrimage to Walsingham in July and liaise with organisations abroad and keep us informed.There are many other varied and challenging areas in which all members are involved. To promote and protect family life. To promote a Catholic education, which will prepare and provide practising Catholics for the future. Hopefully these will provide and offer love and support for families in difficulties and offer help to others finding it difficult to cope in today's materialistic world! In these difficult times UCM are about challenge, listening, supporting, hoping and most of all loving and caring. Membership is open to all Catholic women married or single, to non-Catholic wives of Catholic husbands and may be extended to other Christian women in sympathy with its aims and objectives. The Women's World Day of Prayer, Christian Unity Week, The Catholic Women of the Year Lunch and in many other ecumenical services and celebrations. Our Lady and St Margaret Clitheroe. We have a badge, which is presented to each member when she is enrolled. Our foundation in Our Lady of the Sacred Heart will be 52 years old this year, and the members do their best to uphold the aims and objectives of the UCM. The Our Lady of the Sacred Heart Foundation of the Union of Catholic Mothers (UCM) came into being on 27th May 1964. After consultation with the then Parish Priest, Father Isaac Savin and canvassing the households in the parish; it was the idea of our founder member Mrs Winifred Crawley, who is still a prominent member of our foundation. There was no hall or meeting place in the parish then, so one of our founder members Mrs Marilyn Sterling offered the use of her lounge at her house in Cleveland Road. At that first meeting some 20 ladies attended. Our first permanent meeting place was a room at the Rule & Compass Public House in the village. From there we arranged fund raising events to build our first Parish Hall, a large wooden hut, which still stands behind the Church. Our fortnightly meetings and social events were held there until the present Parish Hall was built in 1969 and we continued our work for the Parish, the community and for charities. The aim of the UCM is to support the family in whatever way we can and this includes the wider family of the Parish and Community. We have taken part in the Women’s World Day of Prayer for many years and host the service every three years. We are fortunate to have several founder members still with us, and at this present time have 19 UCM members. We are kept informed of the work of the National UCM through our Newspaper 'The Catholic Mother'. We take part in the Daily Mass Scheme which ensures that every day there is a Mass being offered for our intentions and in thanksgiving. We support our Parish Priest and help behind the scenes when needed. This year 2010 we presented Fr. Michael with a cheque for 700 pounds for Church Funds. We must also say thank you for the support we have received from the Parish Priests through the 49 years of our existence. 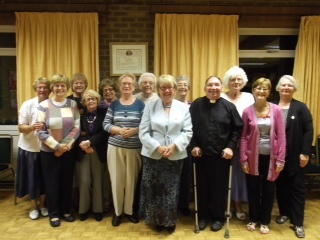 We meet alternate Wednesdays of each month at 8.00 pm in the Parish Hall after evening Mass. Remember us when you have a spare evening and come along to our meeting, you do not have to be a member to celebrate with us. What do the members of the Union of Catholic Mothers do? Well we work very quietly behind the scenes; you will see some of our names on the cleaning and flower lists. When tea/coffee and refreshments are required on any special occasion we will organise it. Four Jumble Sales in a year raise money for church funds, as do our hampers at the Christmas Bazaar and Summer Fete. We do not aim for any profit; most of the money raised goes to the parish in one way or another. On the spiritual side we hope to support each other and all mothers and carers in the parish with help and prayers or in any way we can. See our Parish Newsletter for the date of the next meeting.